An investigation into a fatal fire in northwest Allen County continued Wednesday after the coroner's office identified the man who died in the blaze. Nathan L. Sliger, 55, was identified as the person who died in the fire that began about 7:30 a.m. Tuesday at 5202 W. Wallen Road. According to Allen County tax records, the farmhouse is owned by Nathan L. and Pamela J. Sliger. The cause and manner of Sliger's death are pending and will be released after additional testing and investigation, the coroner said. The Allen County Sheriff's Department and Allen County Fire Arson Specialized Team are also investigating. 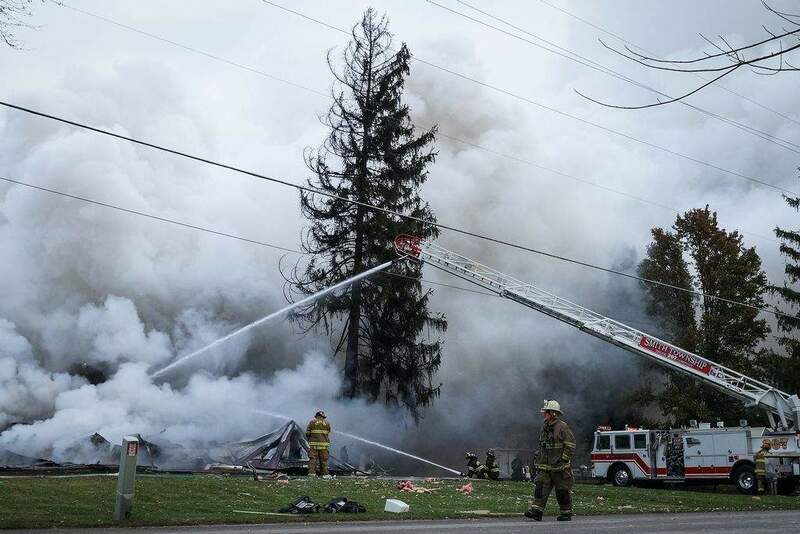 When firefighters from the Washington Township Fire Department arrived, the three-story home was fully engulfed in flames and several explosions were heard, fire Chief Rob Roy said. Neighbors also told The Journal Gazette they heard explosions. It was still unclear Wednesday what caused the fire. Adam O'Connor, Fort Wayne Fire Department deputy chief, said there are several scenarios that can cause explosions. The Fort Wayne Fire Department did not investigate this blaze. Natural gas leaks, gases from the fire itself and aerosol cans are three sources of explosions. O'Connor recalled one Fort Wayne fire where an aerosol can of carbon dioxide used with an air soft gun sitting next to a fireplace exploded and blew out windows and a door. The Fort Wayne department consistently witnesses houses exploding from gas leaks, depending on building construction and the amount of gas, O'Connor said. In another instance, gases inside a burning home blew the side of a home off the foundation. Firefighters inside the home heard a dull whoosh, O'Connor said, but outside, firefighters heard a much louder blast. Fireworks stored incorrectly and explosives such as dynamite could also cause explosions, he said. “It could have been something as simple as paint cans, bottles or containers of oil. Any steel container that has a liquid or gas (that) expands rapidly has the potential to explode,” O'Connor said.